Wednesday was a big day for my new farm. We moved 17 sows and 2 boars to my farm. The sows have always been housed on my parents’ farm, but since we are splitting up our farms, I needed to figure out sow housing on my farm. I could have used the hoop barns, as I have used them for sows with litters and gestating sows, from time to time when I had room. But I figured I would need all three hoop barns for growing pigs, so I brainstormed and decided to use the former dairy barn which is the bottom of my big old red barn. A carpenter friend helped me shore up the old barn door and build the sliding door you see pictured below. 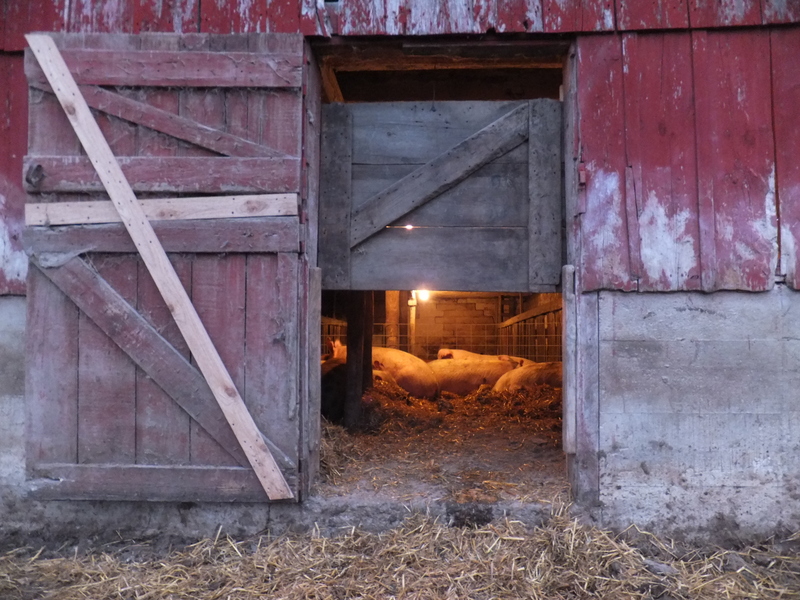 I came up with that so I could lock the sows in or out securely, and I didn’t want a door which swung, because the bedding could pile up next to the door and make it difficult to operate. The sows exit the barn into the cattle lot. This is where the steer calves eat their hay and drink their water. This lot is fenced securely, but I also built another lot to give the calves more room, which is fenced with a two-strand electric fence. 1.Would the sows find and go in the barn? 2. Would the cattle and sows get along, or would they scare each other through the fence? 3. Would the sows see the electric fence, get shocked, then back away instead of going through and destroying it? This is how I managed the situation. I kept the calves and sows separated during the morning. I fed some grain in the entrance of the barn to lure sows in. How did it work? The sows found the barn and all but one were sleeping in it by night. I couldn’t get the one to go in, so I left the door open all night. The calves were scared of the sows, but in a curious way with no stampeding. A few sows were shocked by the electric fence and retreated without destroying it. What didn’t work? The sows enjoyed lounging by the calves’ hay, so the calves wouldn’t eat their hay. I moved the hay further away so the calves could eat. An unanticipated problem was the automatic waterer was frozen. I put in a new Ritchie so the sows could drink, which I’ll post about later. I panicked for a moment, but all I had to do was turn the thermostat up. 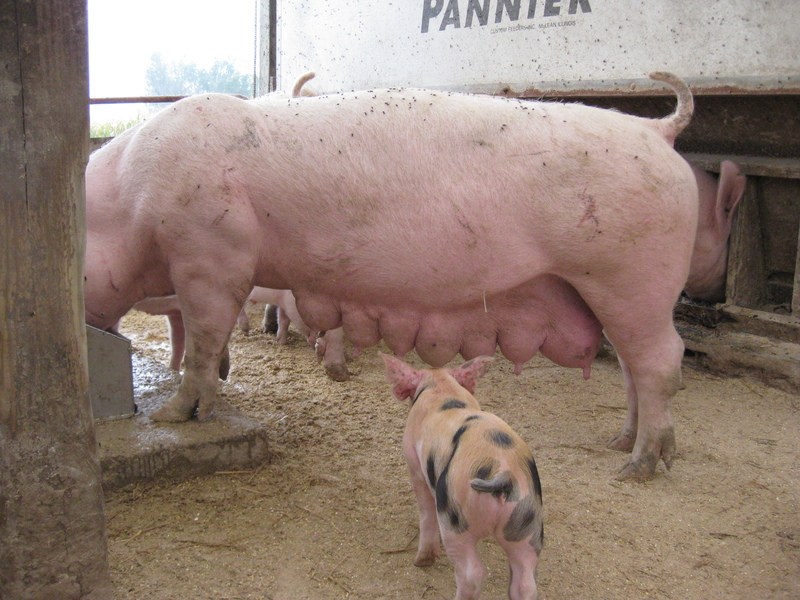 The photo above shows a boar I call “Able” breeding. Standing at the front of the sow is “Bewilder”, my other herd boar I wrote about earlier in the year. This entry was posted on Saturday, December 10th, 2011 at 12:18 am and is filed under Curious cattle, Curious farmer, Curious hogs. You can follow any responses to this entry through the RSS 2.0 feed. You can leave a response, or trackback from your own site. Maybe the cold weather worked in your favor, too, encouraging the sows to go into the barn? Did the last sow ever go in to the barn? Don’t they have “herd intelligence”? Yes, I think the cold weather helped, Chris. The sow was in with the others by the next morning.